Enso Healing Rooms is a long established Bristol therapy rooms now located on Cheltenham Road. 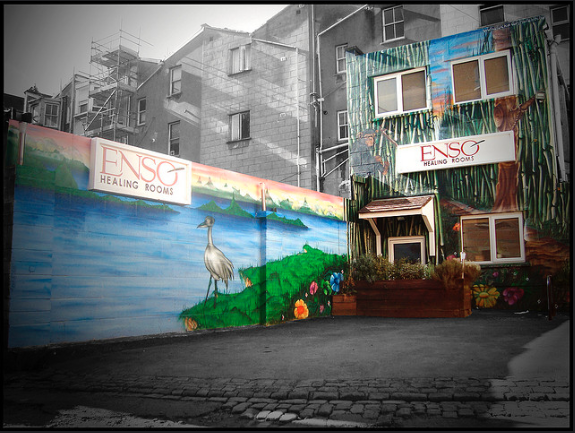 This Bristol therapy rooms shares a venue with Enso Martial Arts, close to the Arches on Gloucester Rd. Enso Healing Rooms has been in it’s current location for 10 years and moved from it’s previous address as a Bristol Therapy Rooms in Staple Hill. We have now expanded the clinic to having six treatments rooms so we can offer more treatments at more times through the week. We offer a relaxed and friendly environment with a team of dedicated staff. The team we have at this Bristol therapy rooms are some of the best Bristol has to offer. Many of our practitioners lecture and teach their chosen subject. Practitioners offer appointments at a range of times throughout the week, you can contact them directly through our therapists page or call us at Enso Healing Rooms for more information. Our practitioners practise both traditional and conventional therapies to treat a wide range of health problems. Access to these Bristol therapy rooms can be accessed through Enso Martial Arts throughout the day and Saturdays. We love that there is such wealth of experience in Bristol, you get such a wide range of choice from the available therapies. All of which are available on your doorstep. From acupuncture to counselling, from massage therapies from all over the world to CBT and Psychotherapy. Speak to any of our practitioners and find out what treatment would suit you best and help the most with your current issue. All the practitioners here will be happy to speak with you and work out a treatment plan specifically of ryou and how to move things forward.